People can be hard to please when it comes to buying Christmas presents — especially if they don't know what they want themselves. A lot of people apparently turned to Google this year when they didn't know what they wanted for the holiday, according to Google Trends' round-up of the top questions about Christmas in the U.S. this week. "What do I want for Christmas" was ranked fourth, following questions about when Christmas is and how to draw a Christmas tree. The top result of a Google search for that question on Christmas Day was a quiz that crunches readers' answers about their favorite soft drink, animal and color and, perhaps tellingly, "Which gift would you most want for Christmas?" to determine what they want to get. Google offered more information on its users' holiday-themed activity this year, too. Sugar cookies were the most searched variety of cookie, beating out gingerbread, chocolate chip, peanut butter and snickerdoodle. Google looked at other holidays, too. Like Christmas, people searching for Hanukkah most commonly wanted to know when it was. The most common question for the annual holiday celebrating African-American culture was "What is Kwanzaa." 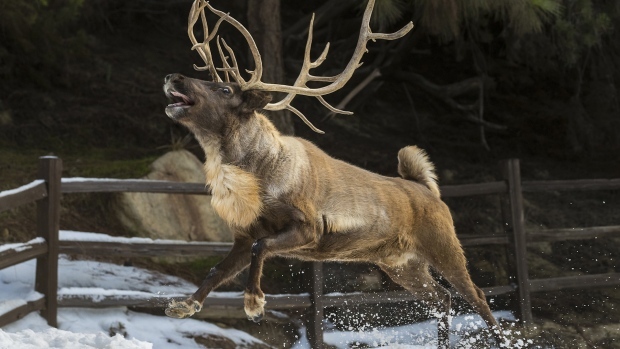 The San Diego Zoo brought in fresh snow for their reindeer. The species, which is native to colder climates, was pretty excited to spend some time in the powder. The holidays are always a busy travel season, and Google reported that people searching "Flights to" most often finished that phrase with Las Vegas, Hawaii and Florida — warm-weather destinations people might be dreaming of escaping to amid the blast of winter weather. See more from the winter holiday Google Trends report here.